There is an easy, non-invasive treatment for bruxism: nightguards. Nightguards are an easy way to prevent the wear and damage that teeth grinding causes over time. 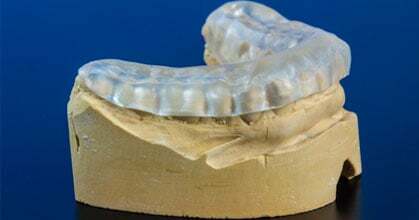 Custom-made by your dentist from soft material to fit your teeth, a nightguard is inserted over your top or bottom arch and prevents contact with the opposing teeth. Bruxism refers to an oral parafunctionalactivity that occurs in most humans at some point in their lives. The grinding of the teeth and the clenching of the jaw are the two main characteristics of this condition, which can occur either during the day or at night. Bruxism is one of the most common known sleep disorders and causes most of its damage during sleeping hours. The clenching and grinding, which accompanies bruxism, is symptomatic of a malfunctioning chewing reflex, which is turned off in non-sufferers when sleeping. For sufferers, deep sleep or even naps, cause the reflex nerve control center in the brain to turn off, and the reflex pathways to become active. Typically, the incisors and canines (front 6 upper and lower teeth) of opposing arches grind against each other laterally. This side-to-side action puts undue strain on the medial pterygoid muscles and the temporomandibular joints. Earache, depression, headaches, eating disorders and anxiety are amongst the most common symptoms of bruxism; which often accompanies chronic stress, Alzheimer’s disease and alcohol abuse. Bruxism is frequently misdiagnosed or not diagnosed at all, because it is only one of several potential causes of tooth wear. Only a trained professional can tell the differences between bruxing wear and wear caused by overly aggressive brushing, acidic soft drinks and abrasive foods. Gum recession and tooth loss– Bruxism is one of the leading causes of gum recession and tooth loss, because it damages the soft tissue directly. It leads to loose teeth, deep pockets where bacteria can colonize and destroy the supporting bone. Other methods of treatment include relaxation exercises, stress management education, Botox and biofeedback mechanisms. When the bruxing is under control, there are a variety of dental procedures such as crowns; gum grafts and crown lengthening that can restore a pleasant aesthetic appearance to the smile.